What’s Included: 1x Chungwa Industrial Touchscreen. Used, excellent condition. Technology: Active Matrix TFT Lamp Pins: 2 Pins Compatibility: 100% OEM Compatible Screen Finish: Glossy Data Cable Pins: 30 Pins Resolution (Pixels): 1280 x 800 Grade: Brand New, A Premium Grade Width x Height: 13.1" x 8.2" Resolution (Type): WXGA Backlight Lamp: CCFL Single Lamp Warranty: 24 months / 730 days Diagonal Screen Size: 15.4 Inch Crossways. MPN: CLAA215FA. Acer Veriton Z410. Part Number: LK.2150A.004. Type: LCD Screen. Display Technology: CCFL LCD. Include: LCD Screen. Screen Size: 21.5". Condition: New. Model number CLAA154WB11A. Desktop Computers. Product Type Laptop LCD Screen. If there does happen to be an issue, we will work with you to make it right! Warranty: Manufacturer warranty. Number of Pins 30 pin. Up for Sale is a genuineCHUNGHWA CLAA156WA12 unit. This CHUNGHWA CLAA156WA12 is in excellent condition and ready to be redeployed. A representative will respond quickly. The item you will be receiving will be labeled with part number CLAA156WA12. Part Numbers: CLAA154WA01, CTAA154WA01, FV1D1AEF, 41117179R. The monitor also has K000015940, PK070018400 - LCD Inverter (FL Inverter Board). Display Screen Type Active Matrix TFT Color LCD. 15.4" CHUNGHWA WXGA Matte LCD Screen. CHUNGHWA CLAA154WB08A LAPTOP LCD Screen 15.4"
MPN CLAA156WB11A. Resolution 1366x768. Display graphics to allow for user interface with the computer Screen is inspected for dead pixels No dead pixels Pass. Screen Size 15.6". Screen Connector Type. Model number CLAA154WB11A. Product Type Laptop LCD Screen. Product Condition: Open Box item which includes accessories. Might show minor blemishes and has manufacturer warranty. Where applicable, manuals/software might not be included. Chunghwa Picture Tubes CLAA070NQ08 XN is a 7.0" a-SI TFT-LCD with 1024 x 600 WVGA resolution, 800:1 contrast ratio, and a 600 cd/m² LED backlight. BEFORE BUYING. BUY BEFORE YOU MAKE SURE THIS ARE THE PART YOU NEED”” ”. It'sYOUR RESPONSIBILITY to make sure that you are ordering the correct item. MPN CLAA154WP05A. Resolution 1400x900. Display graphics to allow for user interface with the computer Screen is inspected for dead pixels No dead pixels Pass. Screen Size 15.4". Screen Connector Type. They both work electronically, but each has a minor defect. One is in great shape, but has a stuck pixel (by orange label). MPN CLAA101WA01A. Resolution 1366x768. Display graphics to allow for user interface with the computer Screen is inspected for dead pixels No dead pixels Pass. Screen Size 10.1". Screen Connector Type. THEY ARE THE CLAA170EA07P SCREENS WHICH CAN BE USED FOR OTHER MODELS. LOT OF 3 - MPC 17" SCREEN. This item could be working or could NOT. There is a handling fee per item to cover those extra expenses. You cannot deviate from your current screen specifications. Purchasing a screen with different specifications will not work with your system. Also Note: You will receive a 100% compatible screen. Screen Size: 14". The screen model is CLAA101NB01. CHUNGHWA LAPTOP CLAA154WA02B 15.4" 1280x800 LCD GLOSSY SCREEN. This includes stating the item sold at a lower value, that the item is not usable, or is a gift. YOU ARE LOOKING AT A USED Chunghwa CLAA154WA04 15.4" Laptop LCD Matte Screen. You cannot deviate from your current screen specifications. Purchasing a screen with different specifications will not work with your system. Also Note: You will receive a 100% compatible screen. 3- Never settle on quality. OutletPC was founded in 2001 and since then we've been focused on getting people around the world great deals on computer products, systems, and hardware. We've built a great selection over the years of all types of PC parts you can choose from to build, upgrade, or buy a desktop or laptop. Acer Aspire Z3751 Z3100-U3072 All-in-one 21.5" 1920x1080 FHD TFT-LCD Touchscreen Display Panel 6M. SEY01.001 CLAA215FA 01. SEY01.001 CLAA215FA 01. Acer Aspire Z3751 Z3100-U3072 All-in-one 21.5". Compatible Models: Acer Aspire Z3751, Z3100-U3072 All-in-One. The screen is original Chunghwa CLAA102NA1BCN. Dead pixel policy: One dead pixel is allowed for Grade A screen. THEY ARE THE CLAA170EA07P SCREENS WHICH CAN BE USED FOR OTHER MODELS. MPC 17" SCREEN. This item could be working or could NOT. There is a handling fee per item to cover those extra expenses. · ITEM CONDITION: NEW. Manufacturer Part Number CLAA101NB01A / E194548. Item 17" LCD Screen. Condition Grade A. 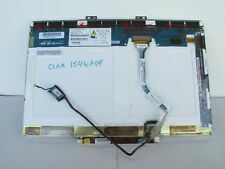 TESTED GOOD LCD Chunghwa 15.4" Genuine Glossy Laptop LCD Screen CLAA154WB09A 1280x800. NO SCRATCHES - GLOSSY. These are important in order. be sure not to remove the tamper proof warranty sticker or. New Jersey May 1 2019. Alabama, Oklahoma, Pannsylvania July 1 2019. Connecticut starting April 1 2019. This is a tested working, used, clean, Chunghwa 15.4" 1280x800 Laptop Screen. Chunghwa Model # Sony Vaio VGN-FZ Series. Serial numbers and revisions may vary. CHUNGHWA 14.1" LAPTOP SCREEN CLAA141WB05A - GRADE A TESTED 100%. If that is the case, we’d be happy to help. Your patience is greatly appreciated.